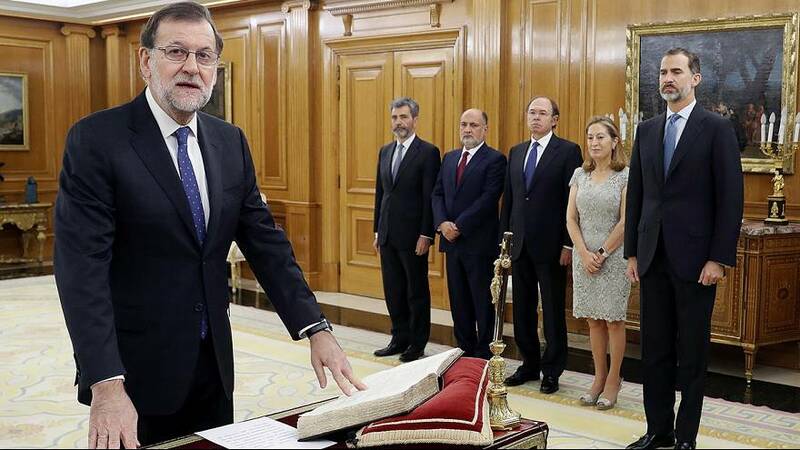 Mariano Rajoy has been sworn in as Spain’s prime minister for another term, ending 10 months of political deadlock after winning a confidence vote in parliament at the weekend. However his conservative People’s Party (PP) still has no absolute majority after losing it in 2015, and will have to strike deals with opposition parties to pass laws. Rajoy, who was sworn in by King Felipe on Monday morning, was unable to find coalition partners for a majority government even after a new election in June. He remained as caretaker premier during that time. His first task will be to form a new cabinet capable of building cross-party support. The opposition socialists reluctantly paved the way for Rajoy’s return on Saturday by abstaining in the confidence vote. But the centre-left party has vowed to fight his policies, raising questions as to whether the government will be able to operate effectively. The weekend vote was marked by another large demonstration in Madrid. Thousands of people protested against Rajoy whose party has been hit by several corruption scandals. However the returning PM has the advantage of being faced with a divided opposition.